The Honda EV Plus was the first battery electric vehicle from a major automaker with non-lead acid batteries. Roughly 340 EV Plus models were produced and released. The EV Plus was taken out of production in 1999 when Honda announced the release of its first hybrid electric vehicle, the Honda Insight. The EV Plus was made to learn about advanced battery use in an electric car and to meet California Air Resources Board requirements for zero-emission vehicles, the same as the new General Motors EV1. It served as a test bed for the pancake-style motor, electronic control unit, power control unit and the Nickel–metal hydride battery (NiMH) later used in Honda hybrids and developed further in the first Honda FCX Fuel Cell Vehicles made from returned (decommissioned) EV Plus chassis. The EV Plus featured on-board conductive charging with the Avcon connector, passive battery balancing, regenerative braking and deceleration, AC/heat-pump climate control, HID headlights, 4 seats, and electrically heated windshield. Units deployed in cold climates also had oil-fired heaters for faster cabin heating and passenger comfort. As with virtually all vehicles, range was affected by driving style: rapid acceleration, high speeds, and fast stops lowered the all-electric range significantly. United States Environmental Protection Agency rated at 81 miles (130 km), careful driving would give it a range of just over 100 miles (160 km). The EV Plus came with a 12 V battery for running normal 12 volt accessories and lighting. Range: 100 miles or 160 km (80% discharge) under ideal conditions. EPA Rated to 81 miles (130 km) range (UDDS). The EV Plus was listed with an MSRP of $53,900, but Honda never allowed them to be sold, instead offering the cars on a 3-year, lease-only program for $455.00 mo. Honda allowed some customers to extend their EV Plus lease for a few years. At the end of the leases, all EV Plus cars were taken back by Honda as decommissioned and eventually destroyed. 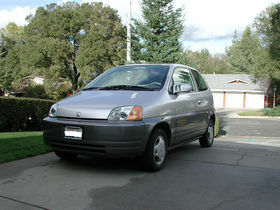 A few Honda EV Plus chassis were used as the base for some of Honda's first hydrogen (H2) fuel cell vehicle prototypes. Then those prototypes were also destroyed. Wikimedia Commons has media related to Honda EV Plus. This page was last edited on 5 March 2019, at 17:39 (UTC).